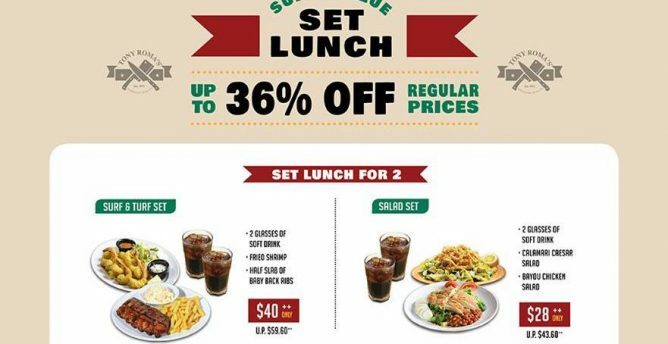 Home > Dining and Gourmet > Tony Roma’s: Save Up to 36% on Super Value Weekday Set Lunches at Suntec City! Ongoing till further notice Tony Roma’s: Save Up to 36% on Super Value Weekday Set Lunches at Suntec City! 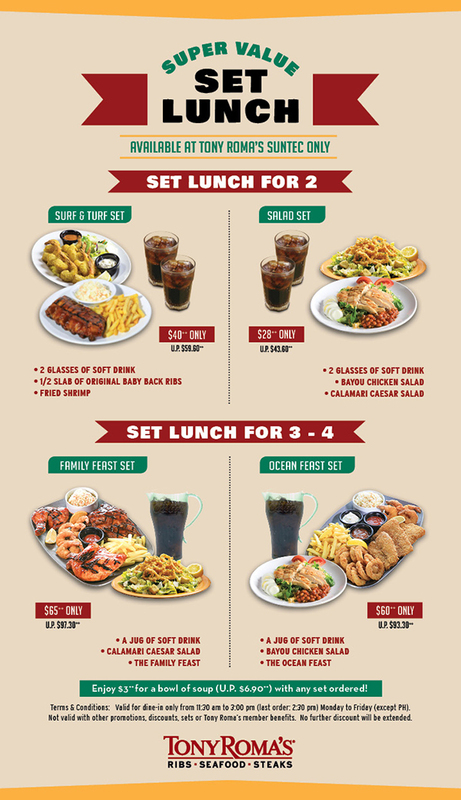 Enjoy up to 36% off on Tony Roma's Suntec Super Value Weekday Set Lunches that are big on value and easy on your pocket! Available at Tony Roma's Suntec City only. Promotion: Save Up to 36% on Super Value Weekday Set Lunches at Tony Roma's Suntec City! Valid for dine-in only from 11.30am to 3.00pm (last order: 2.30pm) Monday to Friday (except PH). Not valid with other promotions, discounts, sets or Tony Roma's member benefits. No further discount will be extended. Previous: OG Singapore: Get 20% OFF Prestige Beauty Brands’ Regular-Priced Items & 20% OFF General Brand Cosmetics, Toiletries & Health Supplements!